You deserve a springtime reward. 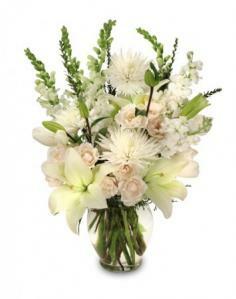 Don's Custom Floral will design a glorious bouquet of spring flowers for your home. Bring in the spring sunshine with a vase of daffodils. Capture the fresh breeze of a spring day with a basket of flowers. Celebrate the simple pleasures of spring with blue iris, pink gerbera daisies or rosy tulips. Feel the day's delight with spring flower arrangements. Everywhere you turn in Hutchinson, KS the revival of spring is felt. 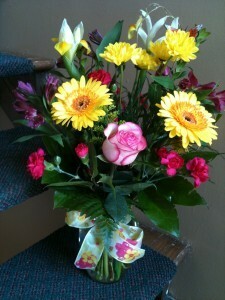 Don's Custom Floral has a charming collection of spring flowers waiting to brighten your day. 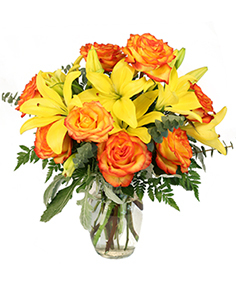 Don's Custom Floral creates a sunny sensation with vibrant summer flowers. Select a sizzling summer flower arrangement to add pizazz to your home or office. Send a ray of sunshine with a floral bouquet of summer flowers. Add a punch of tropical colors to your summer fun with a glorious flower arrangement. Celebrate the carefree days of summer with a crescendo of garden delights arranged impeccably in a vase. From the first bang of the season to the end of Indian summer, Don's Custom Floral creates a spectacular parade of colorful flower arrangements. Fun, festive and irresistible; the sheer pleasure of summer flowers awaits you in Hutchinson. Don's Custom Floral creates a tantalizing, seasonal potpourri of warm fall colors with their vibrant, fall flower designs. Select an arrangement with glowing fall colors to illuminate your Hutchinson, KS home. Show a little affection with a floral bouquet of autumn flowers. If you're more daring, be a little flirtatious with a fall vase arrangement filled with copper, saffron and pomegranate colored flowers. The expressions of fall can be found everywhere in Hutchinson KS. 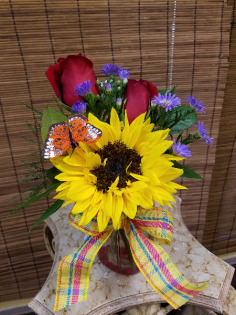 Whether you want a homespun delight or a festive centerpiece, fall magic is always available at Don's Custom Floral. The chill maybe in the air, but Don's Custom Floral creates a cool elegance with winter flower arrangements. Chase away the winter blues with a selection of fresh flower arrangements to adorn your home. Celebrate the beauty of fresh fallen snow with glacier-white colored flowers, intertwined with a platinum ribbon exquisitely arranged in a vase. If you love the nighttime winter sky, bring a little star gazing to your office with an amazing 'Star Gazer' lily flower arrangement. A breathtaking display of winter beauty is found in the frosty air, moist snowflakes and billowy clouds of the season. With each floral bouquet, Don's Custom Floral creates a mesmerizing winter wonderland.